New Civilization News: 2006 Crop Circle..
rather than a mere circle. is the spiral - of moving up in consciousness, the whole linked together. I also see the hint of the yin-yang. too much Pimms and a lawn-mower, mayhap? on strike for....????? More pimms perhaps??? 22 Jun 2006 @ 16:14 by bushman : A fake, by amatures. You can plainly see several mistakes. the design... the design seems rather compelling. execution hence I'd give it an 8 for design and a 5 for craft. flashback to the sixties aye? Imagine a language with out punctuation - a flow no beginning - no end. Yet rhythmic even musical - almost a sense of I know what it says - I just don't have the volume up loud enough. There is no evidence to suggest that UFOs are craft from other planets, or even other star systems, and there is only very circumspect and highly suspicious evidence to suggest they are solid, nuts and bolts craft. The way to work everything out is to proceed in the opposite direction and flow of information, for the UFO scene is riddled with disinformation.. As are crop circle investigations and other transdimensional conspiracy theories. Some crop circles are real and they are manifestations of the Goddess talking to us of the fractal nature of the universe. Other crop circles are misinformation by transdimensional seeking attention. Its part of their ploy to sell people the idea of higher beings from outer space. The Daily Mail in the UK. a true blue propagand outfit, writes ludicrous stories during crop circle season. It says that crop circles are made by blocks with planks. It creates deliberate falsehoods, saying that the feild is sown with wheat when it is barely, or it incorrectly describes the location of the feild, and so forth. They claim that two guys can make a 300 yard wide crop circle with two planks, in the dark, in three hours with absolute mathematical precision without being seen. The secondary ploy is to scare and confuse people. There is a theory that crop circles are formed by earth spirits who want to help people achieve a higher consciousness. I don't accept that theory - too dippy. Crop circles are very interesting, and extremely bothersome. They’re impossible to understand, unless you can rotate your mind up to another level. The trick is to realize that the circle or pattern on the ground, in the crop, in the field, is only half of the crop circle. The rest of the crop circle is invisible, and is under the ground, in a mirrored world. I can’t tell you anymore, because for reasons I can’t go into here, I have an edgy feeling the authorities might offer me a bullet in the blinking head if I tell you what the crop circles are really about. I might be wrong but early death is against my religion. 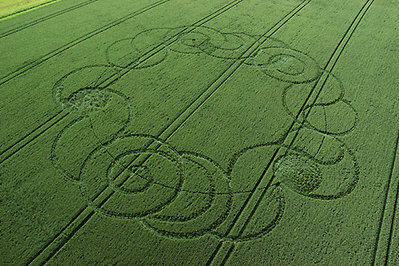 Nothing like a decent cropcircle to restore ones faith in art. have any 2007 designs shown up.